A full complement of brackets is available for attaching system components to ladder rack, threaded rod, auxiliary framing, strut, equipment racks, raised floor pedestals and walls. FTRBE58 is used for supporting the 2 x 2 and 4 x 4 Fiber-Duct systems from existing threaded rod installations. Bracket is secured to threaded rod with two split nuts. 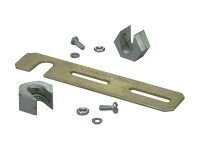 It contains hardware for attaching to threaded rods and hardware for mounting channel to bracket.